Michelle Obama gave an interview to Oprah Winfrey not long after the inauguration. 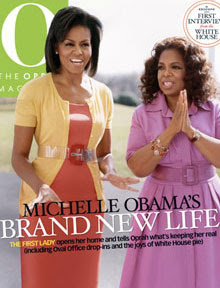 Magazine lead times being what they are, the March issue of O magazine debuted the First lady for a double O cover shot. This was first time since the magazine's inaugural that honor was shared. Something old, something new, something borrowed and something blue underscores the grand old mansion with its 132 rooms, 6 tiered levels, garland trim bedecking the North Portico, and receiving rooms galore. This is the culmination of a new beginning for any First Family as they enter the Diplomatic Reception Room to gain access to their new living quarters on January 20th every four years. 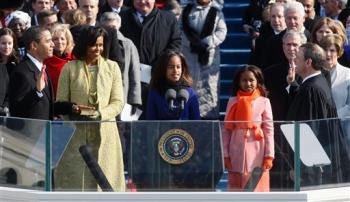 For Michelle Obama, her first visit to the White House was as a junior senator's wife accompanied by her two daughters as part of an invitation from Laura Bush to congressional families. Malia and Sasha remembered petting Barney. 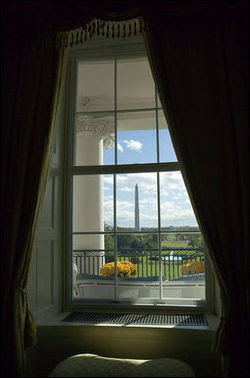 On the second floor of the White House, the Yellow Oval Room—part of the First Family's private residence—offers a stunning view of the nation's capital. The Washington Monument stretches into the heavens. The Lincoln Memorial sits above the glassy water of the Reflecting Pool. In the distance, you can see the U.S. Capitol, where the world's attention was focused on January 20 as millions gathered to witness an event many had thought would never happen. This room is where I interviewed First Lady Michelle Obama in February, and as I gazed out the windows and took in the view, I was struck by the immense legacy she and her family have inherited. I felt the weight of history, and I understood what she means when she says, as she often does, "This is not about us. "Now the country wants to know more about what happens at 1600 inside the graceful executive residence built by an Irish architect. 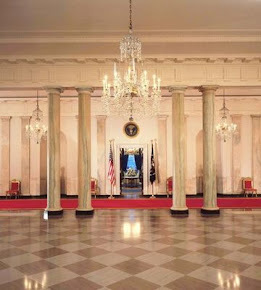 Oprah was the first to get an indepth interview from inside the residence in th e Yellow Oval Room. 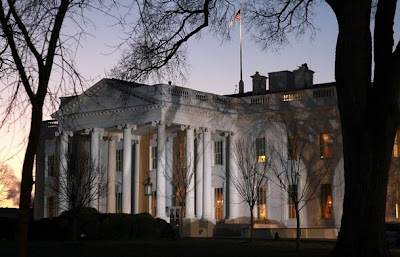 What the First Lady wears, as well as the nationality of the designers, will keep her press office in the East Wing very busy as the minutest details will not go unremarked. 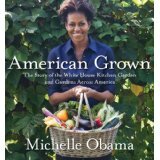 Gift exchanges can be fraught with peril and poison relationships as noted by the British press that were deeply miffed with the less thoughtful gifts (Movie DVDs and toy replicas of Marine One) given to Prime Minister Gordon Brown when he and his wife traveled to DC. Mrs. Obama can have the truly elegant touch with gifts as on her first day to become the First Lady of the Land she carried a gorgeous red-ribboned gift for Mrs. Bush that held an engraved pen and leather journal. Now we all get to wait and see how the Obamas' navigate the cultural and style requirements abroad.